Sir William Rees Mogg is an English journalist and life peer who is well-known for his role as Editor of The Times. Born in 1928, he completed his studies at Oxford University where he also served as President of the Oxford Union in 1951. 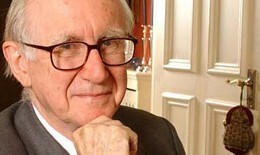 His journalism career began at The Financial Times in 1952, before he undertook a position at The Sunday Times in 1960. His journalistic skills were quickly recognised and shortly after joining the publication he was made Deputy Editor. Sir Rees Mogg also branched out into politics during the 1956 by election when he contested the seat of Chester-le-Street as a Conservative candidate, he was however, defeated by Labour’s Norman Pentland. From 1967 to 1981, Sir Rees Mogg served as Editor of The Times. In 1978 he served as High Sherriff of Somerset for a year before being made a life peer in 1988. He sat in the House of Lords as a cross bencher and also served as a member of the European Reform Forum. He also held the role of Chairman at Pickering & Chatto Publishers and NewsMax Media, as well as writing a weekly column for The Mail on Sunday.